As I have mentioned before on here, NARPRO.com is full of awesome, community minded shop owners. 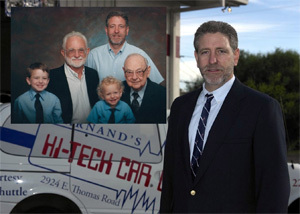 Good example is Jim Garnand, owner of Hi-Tech Auto Repair in Phoenix. He called me last week and asked for my help in spreading the word about his “Name Your Own Oil Change” idea. After the news of Officer Barry Scott’s death after a charity boxing match, Jim had a personal reason to do something for the family of Officer Scott. His brother in Tucson was in a similiar situation, didn’t die, though, but Jim knew how hard this had to be on the family. So, Jim decided to let people name their own price for an oil change. The donation will go to a bank account in Scott’s family’s name. I sent this info out, and within minutes I heard back from Jim saying reporters were calling. I didnt even have to pick up the phone…it was a relevant, timely, community idea that was offering a “deal” for a good cause. Thank you to KTAR, FOX 10, ABC 15 and the Phoenix Republic for helping to spread the word. -Includes oil and filter and any additional fluids your vehicle needs. You name the price and that is all you pay. That amount is deposited in the Officer Barry Scott Account. Receive a certificate for an oil change to be scheduled this year. Following the tragic and untimely death of Officer Barry Scott, the Phoenix police officer who collapsed after a charity boxing match, a bank account has been opened to aid the wife and infant child he left behind. Donations will go to the 22 year old Scott’s wife and baby, according to Phoenix police. Scott was a veteran of the Iraq war who joined Phoenix police in the summer of 2007. He collapsed after a charity boxing event last week. Hi-Tech is a AAA Top Shop, a member of NARPRO (Neighborhood Auto Repair Professionals), ASE and an Arizona Green Business. This entry was posted in blog and tagged auto repair, hi-tech auto, jim garnand, NARPRO, officer barry scott, oil change, phoenix. Bookmark the permalink. One Response to "Do Good, Get PR"